Education is rapidly being transformed and like any good design challenge, it is important to hear from the users. In the case of school, the primary users are the students and thus the idea for this magazine was born- a magazine driven and written by students about the Education Transformation Movement. Trailblazers will be published once each school semester, at least while we’re still starting out. Each edition will contain articles written by young learners from around the world as well as additional resources chosen by the curators including other blogs and books that might not be created by students but are chosen by them. 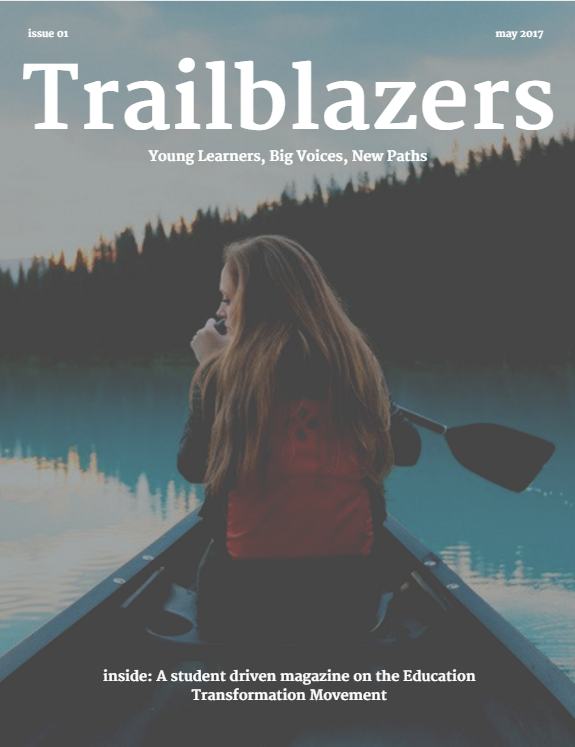 The purpose of Trailblazers is to create a platform for young learners around the world to be able to share their stories and opinions on transformative education in a collective format. We hope that this gets read by all learners interested in making all education learner-centred. We are young learners, with big voices, paving new paths; these are our stories. Check out our official Trailblazers Website and our podcast episode with the founders on TL Talk Radio!